At present, the emulation of photosynthesis in plants - by using light to transform abundant and stable molecules such as CO2 and water into a high-energy fuel (hydrogen) or into chemicals of industrial benefit, is a major research challenge. Artificial photosynthesis in solution is still restricted by the use of toxic and expensive metal-based compounds to tap sunlight. Scientists from CNRS, CEA, and the Université Grenoble Alpes have come up with an efficient substitute using semiconductor nanocrystals, or quantum dots, based on low-cost and less toxic elements such as sulfur, indium, and copper. Their study has been reported in the Energy & Environmental Science journal on April 10, 2018. In artificial photosynthesis systems, light energy is absorbed by chromophores, or “photosensitizers,” which then transfer electrons to the catalyst that activates the chemical reaction. Despite considerable advancements in the recent past in the development of catalysts that do not contain noble metals, photosensitizers are still mainly dependent on molecular compounds that contain expensive and rare metals such as iridium and ruthenium, or on inorganic semiconductor materials that contain cadmium, which is a toxic metal. 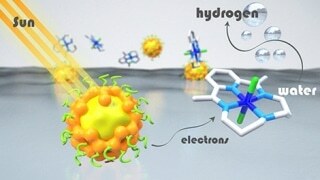 As a first ever attempt, scientists from the Département de Chimie Moléculaire (CNRS/Université Grenoble Alpes) and SyMMES (CNRS/CEA/Université Grenoble Alpes) have shown, by combining their expertise in photocatalysis and semiconductor engineering, that hydrogen can be synthesized very efficiently by integrating inorganic semiconductor nanocrystals, or quantum dots, formed of an indium sulfide and copper core protected by a zinc sulfide shell, with a cobalt-based molecular catalyst. In this “hybrid” system, the great stability and the exceptional visible light absorption characteristics of inorganic semiconductors are combined with the efficacy of molecular catalysts. The system exhibits excellent catalytic activity in water in the presence of excess vitamin C, which provides electrons to the system. This catalytic activity is the best achieved to date using cadmium-free quantum dots. The performance of this system is considerably higher than that achieved by using a ruthenium-based photosensitizer. This is because of the extremely high stability of inorganic quantum dots, which can be recycled for a number of times without any significant loss of activity. These outcomes demonstrate the higher potential of these hybrid systems for hydrogen production by tapping solar energy.